The Sensei is a character in WarioWare: Smooth Moves who resides in Diamond Dojo. He appears during Kat and Ana's stage, "Evil Attacks Diamond Dojo!". A Little Ogre somehow finds its way into the Sensei's room, which leads to an Elephant Ogre attacking the entire dojo. 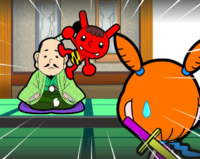 While the giant ogre is attacking, the Little Ogre pesters the Sensei through various methods, such as pulling his hair. Soon enough, Ana enters the Sensei's room and sees both him and the Little Ogre. The Elephant Ogre eventually stops attacking the dojo once the Little Ogre calls out to him and Kat to stop fighting, leaving the Sensei in peace. This page was last edited on September 27, 2018, at 14:05.